Imagine a situation where Israel is in the midst of a widescale war in the northern theatre and IDF troops are required to stay behind enemy lines for a prolonged period of time. Slowly, their ammunition, food and drinking water run out. As a result of their location, they cannot be resupplied from the ground. This is where the air force comes in, capable of performing airdrops of essential equipment using the "Karnaf" (Hercules C-130HI) and "Shimshon" (Super Hercules C-130J) aircraft. This situation isn't imaginary, and the last time it happened was the 2006 Second Lebanon War. Over a decade later, the IAF continues to improve in the field of airdropping supplies, now integrating a new mission: autonomic airdrop. 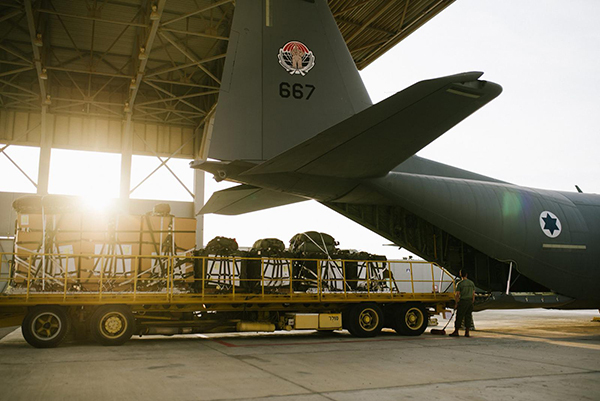 This means that the airdropped cargo is able to direct itself towards the ground forces. Over the past two months, the IAF Flight Test Squadron has concluded a series of tests on a wartime airdrop system. Throughout the past years, the IDF has purchased a limited amount of such systems in order to test whether they are recommended for use in Israel, and may purchase additional systems in the future. "The system was purchased in 2015 and the Flight Test Squadron held a series of tests upon its arrival", said Maj. (Res') A', the squadron's test leader. "The test results showed that the system was not yet qualified for operational use, and it was then decommissioned in the air force. Recently, it was decided to re-examine the system after it began showing perfect results, just as the manufacturer designed". The test crew on the aircraft is made up of members from the 103rd ("Elephants") Squadron operating the "Shimshon" aircraft alongside a test pilot seated in the cockpit. There are several people seated in the cargo hold, including a loadmaster, a test engineer, representatives from the Marom Unit, a representative from the Technological & Logistical Directorate and service members from the Airborne Supply Unit. On the ground are designated crews scanning the area for IEDs and hostiles, while a helicopter in the air ensures that the coast is clear. At the same time, a squad in the field stays in place and waits for the arriving airdrop. 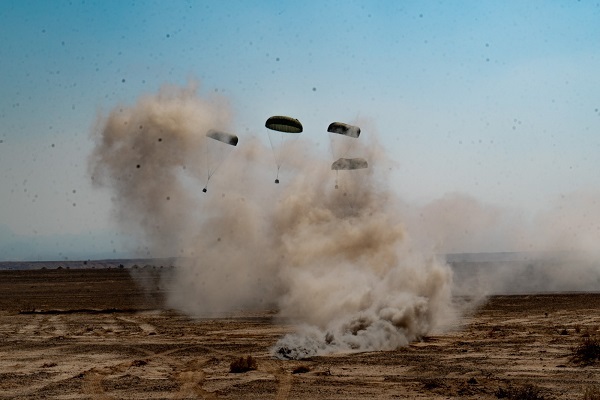 The test series included several nine-hour-long flights, as part of which a total of 18 airdrops were performed. "In the first flight, we dropped the autonomic airdrop from a great height and saw that the parachute opened and that the system directed the equipment successfully. It was amazing to see the system hit the mark on the ground", described Maj. (Res') A'. Maj. (Res') A' said that this was a complex test for the squadron: "When testing a new system, we usually receive all the necessary data. This time, we barely had any information about the system and had to collect any small piece of information at hand. It was a significant challenge. In addition, the test included intense cooperation and a large number of participants. The Marom Unit, the Technological & Logistical Directorate and the Munitions Department were all involved, and various aircraft of different types took part. Synchronizing everyone involved isn't simple". The system is used in multiple militaries around the world, mainly for the goal of airdropping tactical teams alongside the equipment. "The capabilities provided by the system greatly improve the airdropping transport aircraft", elaborated Maj. (Res') A'. "The system allows us to airdrop equipment from high altitudes with the equipment directing itself to its destination. This is a significant improvement for us. The squadron will receive a huge operational advantage and include drastic changes in training, instruction and operational activity. We will prepare heavily for the system's integration and our operational capabilities are due to improve".